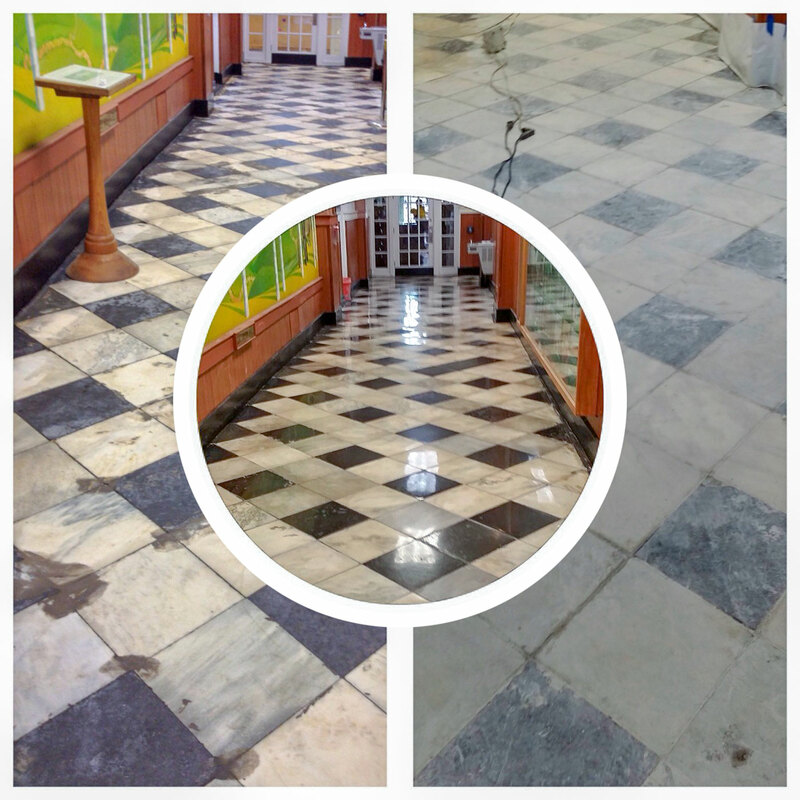 During the restoration of Greenfield Town Hall in Western Mass., Boston Stone Restoration pulled up carpeting that had been there for decades to reveal checkerboard marble. Thankfully, marble is the stone care specialists’ “sweet spot,” says co-owner Melissa Bunis, though they also work on granite, terrazzo and other natural stone. Melissa and her husband, Paul, with whom she owns the company, have a passion for natural stone and for returning luster to marble flooring, and repairing chips and scratches. To achieve this particular “after,” the firm had to carefully scrape up all of the adhesives left from the carpeting before cleaning and polishing the classic geometric pattern. Boston Stone Restoration uses a wet grinding method for their transformations, explains Bunis, and darker browns and black marbles are notoriously harder to polish. Checkerboard marbles in particular are tricky; when black marble is honed, it can release a slurry, which can stain the highly porous white stone adjacent to it. In this municipal building's dramatic makeover, specialists took great care to ensure that the black didn’t bleed into the white.